Book NOW! Use code BLACKFRIDAY until 30.11 for 10% off! Robin Hood The Christmas Adventure! 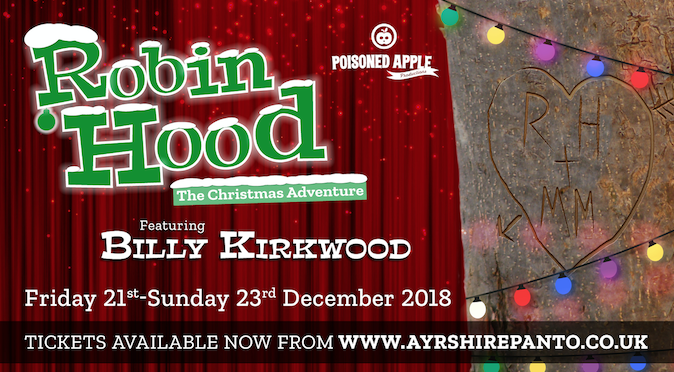 Robin Hood is the 2018 pantomime starring BAFTA award winning comedian Billy Kirkwood and presented by Poisoned Apple Productions at St Matthews Academy in Saltcoats this Christmas! Some of the fabulous cast of Aladdin return to the stage this year to bring you Robin Hood! Join Robin Hood, Maid Marian, Little John, The Sherrif of Nottingham, Friar Tuck, The Lady in Waiting, Price John, King Richard and Street Beatz Dance Crew and the rest of our cast for a day of family fun, laughter and surprises! This pantomime is full of songs, dancing and hilarity from start to finish and suitable for all the family. 5 Star Reviews from 2017. Myself and all of the family loved the pantomime today! So funny and captured the children’s attention (even my 11 month old) from the beginning! Well done to everyone involved and was so kind of all the cast to meet the children and pose for photographs afterwards, my little boys favourite was “the lady with the rollers who washed clothes” 😂already looking forward to next year! This event is organized by Poisoned Apple Productions.